Why Do We Develop Gum Disease? In the United States alone, millions of adults suffer from varying stages of periodontal disease. If left untreated, the disease can soon increase the risk of adult tooth loss. Why do we develop gum disease? 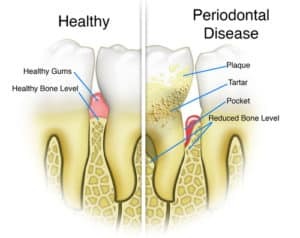 Understanding the causes and symptoms of gum disease can help you identify the issue in the early stages and also help you understand the best ways to help prevent periodontal problems. Answer: When bacteria break down the food articles in our mouth they create a biofilm called plaque that coats our teeth. Eventually, plaque can harden into tartar, irritating the gums and causing inflammation (gingivitis) to form. Over time, the inflammation can cause the gums to pull away from the teeth and form pockets for bacteria to enter, leading to the onset of the disease. Question: What are the symptoms of the disease? Answer: In the gingivitis stage you may notice redness or soreness in your gums. Later, you may develop bleeding when you brush or floss. Don’t ignore changes or discomfort in your gingival tissue, contact your dentist for a through diagnosis. In the gingivitis stage the issue can be cured. However, once gum disease forms it can only be managed. Question: Can our daily habits worsen the disease? Answer: Yes. Poor oral hygiene, as well as smoking or tobacco use, can cause and/or worsen inflammation, making the likelihood of developing the disease much greater. Question: How can we avoid periodontal disease? Answer: You can start by brushing and flossing your teeth thoroughly and properly every day. You should also have your teeth professionally cleaned about once every six months. A cleaning is actually the only way to completely remove plaque and tartar from your teeth.